As we celebrate Veterans Day this year, it is instructive to consider the contributions of our presidents to our nation’s defense and military. Of America’s 43 presidents, 31 have served in the military. Ten, most notably George Washington, Andrew Jackson, Ulysses S. Grant, and Dwight Eisenhower, attained the rank of general. Five others held the rank of colonel. Three future presidents engaged in combat in the Revolutionary War, five in the War of 1812, three in the Mexican-American War, five in the Civil War, one in World War I, and eight in World War II. Only one future president—Theodore Roosevelt—participated in the Spanish-American War in 1898. When the war broke out, he resigned his position in the Department of the Navy, formed the Rough Riders (a volunteer cavalry regiment), and led a famed charge up San Juan Hill in Cuba. Roosevelt was one the most colorful, flamboyant and interesting personalities of any time period. He was a historian, naturalist, explorer, rancher, war hero, journalist and reform-minded civil servant. To some he was larger than life, like his monument later carved in stone on Mount Rushmore. The Sage of Oyster Bay was an exemplar of manliness and “muscular Christianity,” and an exceptional president who led a crusade for social justice and challenged the power of America’s corporations. Roosevelt strove to promote peace by strengthening the United States. True peace, he insisted, depended on providing justice. He preferred to achieve upright arrangements through peaceful means, but he was willing to use force to attain this end. “We infinitely desire peace,” he declared in 1903, “and the surest way of obtaining it is to show we are not afraid of war.” The United States must deal justly with weaker nations, he asserted, and show the strongest ones that it could maintain its rights. While speaking courteously and dealing fairly, America must “keep itself armed and ready.” If the English Puritans led by Oliver Cromwell and the American Founding Fathers had valued peace more than righteousness, Roosevelt contended, they would never have used war to end their oppression. The colonel declared, however, that he abhorred war and rejoiced that during his seven and one-half years as president not a single soldier fired a weapon against a foreigner. 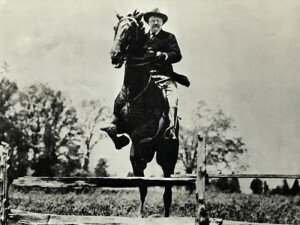 Roosevelt’s most famous aphorism—“speak softly and carry a big stick”—contributed to his reputation as bellicose and impetuous. Numerous critics claimed that “he rarely spoke softly and wielded his Big Stick all too readily.” In reality, Roosevelt’s rhetoric was much more belligerent than his actions. He skillfully settled numerous disputes, including the 1904 Russo-Japanese War (for which he received the first Nobel Prize awarded to an American), a conflict over Morocco in 1906 and several clashes between Central American countries. Roosevelt boasted that at the end of his presidency, the United States was, “at absolute peace, and there was no nation in the world … whom we had wronged, or from whom we had anything to fear.” Blessed by not having to deal with a major international crisis, Roosevelt improved relations with Great Britain, dealt adroitly with Germany, began construction of the Panama Canal, and pursued as enlightened a policy in the Philippines as America’s imperialist assumptions permitted. Two years later, Roosevelt commended Civil War veterans for showing Americans that “the greatness of a nation is to be measured not by … its material prosperity,” but by the citizens it produces. By their willingness “to count everything” else “as dross” compared with “the sacredness of the republic” these soldiers had preserved the United States. His appreciation of the fortitude, virtues and sacrifices of American military personnel led Roosevelt to issue an executive order in 1902 declaring that whenever possible, preference would be given in appointing and retaining “honorably discharged veterans of the Civil War, who are fit and well qualified to perform the duties” of the positions they sought or filled. In his annual messages, Roosevelt repeatedly argued that no other group of citizens deserved greater honor, respect and gratitude than the nation’s veterans and he worked to ensure that they received pensions.